You can use keyboard shortcuts (also known as hotkeys) to quickly activate many menu commands and tools in CorelDRAW® X3. The keyboard shortcut for a menu command is displayed to the right of the menu item; the keyboard shortcut for a tool is displayed in a ToolTip when you hover over the tool. 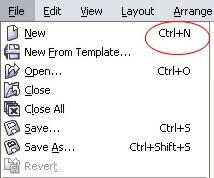 This example shows the keyboard shortcut (Ctrl+N) for starting a new project. This example shows the keyboard shortcut (F10) for activating the Shape tool. Below are the keyboard shortcuts for some commonly performed tasks. Note: For a complete list of keyboard shortcuts, see the CorelDRAW X3 Quick Reference Card included in your software package.